"Why am I still here? Why is God letting me suffer so long?" 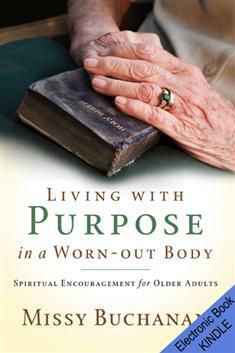 Frailty, dependence, and constant pain can lead to spiritual hopelessness in older adults. While we're inspired by occasional news about an extraordinary centenarian who swims every day, it's more common to grieve and wonder as loved ones grow feeble. Buchanan fosters empathy for the frail elderly and expresses their deepest concerns without tap-dancing around the tough issues. Forty-two short, comforting devotions offer spiritual encouragement to those who now cope with daily limitations and failing health. The devotions are written in the first person, allowing readers to speak directly to God about their concerns. Supporting scriptures from the New Testament and Psalms are included with each meditation. Buchanan writes to the experiences of lifelong Christians as well as elderly non-believers who are thinking anew about God. Help someone you love find a reason and way to live out God's purpose in spite of their limitations.